More info:Prices based on 2 adults sharing. From $1360 - $1410 per child inc UK flights. Mimimum age 7. Pedal power is one of the most sustainable and lowest impact forms of transport so it’s a great way to keep your carbon footprint (and waist measurement!) low. Our accommodation aboard a traditional ‘Oldtimer’ is low impact too - owned by the same family for over 20 years, they ensure it is run in as environmentally a way as possible and even the majority of the food served on board is locally sourced. Our leaders on the tour are all trained in responsible tourism matters and work to our detailed Responsible Tourism Policy which helps us to protect our surroundings as we travel. We support a variety of charities and projects worldwide which support vulnerable communities and habitats including Friends of Conservation, Hope Worldwide and Send A Cow. We are also actively engaged with UK travel industry bodies which promote best practice in responsible tourism, such as Tourism Concern, The Travel Foundation and AITO. Our commitment to responsible tourism is not limited to our overseas operation and we have measures to ensure our UK office operates according to our responsible tourism policy. Carbon offsets for all flights booked with us are included in the tour cost. As well as being low impact, cycling is a great way to get closer to the local way of life as you can easily stop and visit offbeat places, chat to the locals… so it’s friendly and environmentally friendly! 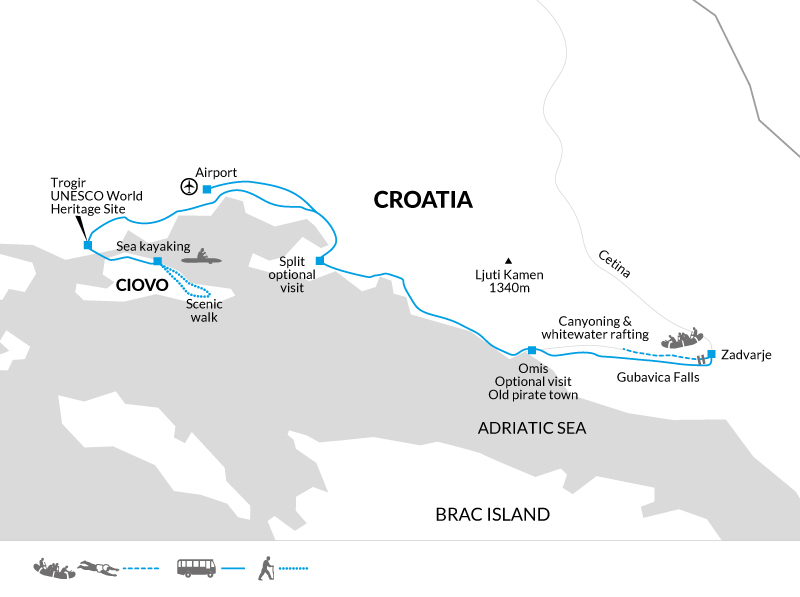 Croatia is without doubt one of Europe’s most fascinating countries and for years one of its best kept secrets. The Croatian people have put enormous efforts in rebuilding their country since the Civil War and your visit brings support to communities throughout this fascinating region. We uncover some of those secrets with the help of our tour leader who will be able to explain aspects of the history, wildlife and culture of the region. The boat we use is locally owned and run and has been in the Captain’s family since it was built in the 1920’s. We eat about half of our meals aboard the boat, prepared with locally sourced produce. Other meals we take in local restaurants, ensuring that we support a wide range of small local businesses and get to taste a great variety of food.